I recently had a friend tell me she didn’t like Thanksgiving because of all of the casseroles. GASP!!! Or maybe you’re on her side (which is okay…I guess) but isn’t that why so many folks love Thanksgiving. 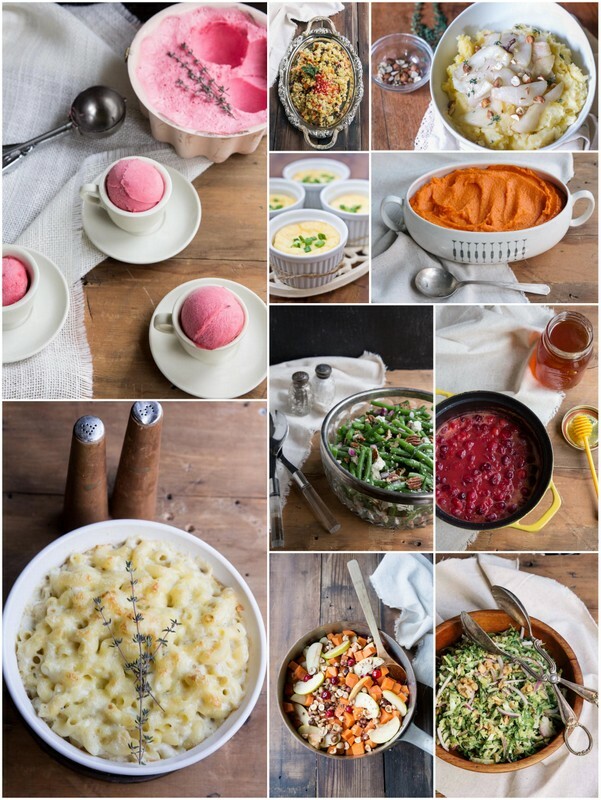 It’s less about the turkey (though I do have an amazing turkey recipe) and really all about the rich, cheesy, buttery, sweet or savory baked casseroles or for more modern term, veggie sides. I know that’s why I love it. And it doesn’t have to be heart burn inducing. Most of my Thanksgiving Side Dishes are on the healthy side. I use bright and colorful veggies with nuts and a little less cheese and sugar than most. 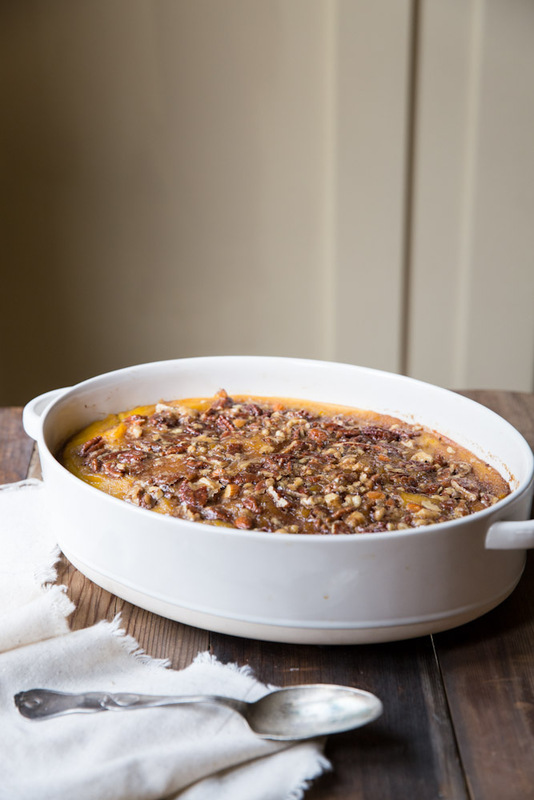 This recipe for Roasted Squash Casserole with Maple Nut Praline is a lighter and more modern take on the Sweet Potato Casserole that many of us grew up loving. I transformed a Sweet Potato Casserole recipe from an old Country Living magazine that my friend picked up at a vintage shop. I made it with acorn squash because acorn squash is more nutty than other squashes which I thought would compliment the praline and also be a bit more conservative on the carb side compared with the potato counterpart. I flavored the dish with orange juice and zest, as well as maple syrup. There is still butter and brown sugar involved but almost half as much as the original recipe and believe me, it’s still sweet enough! 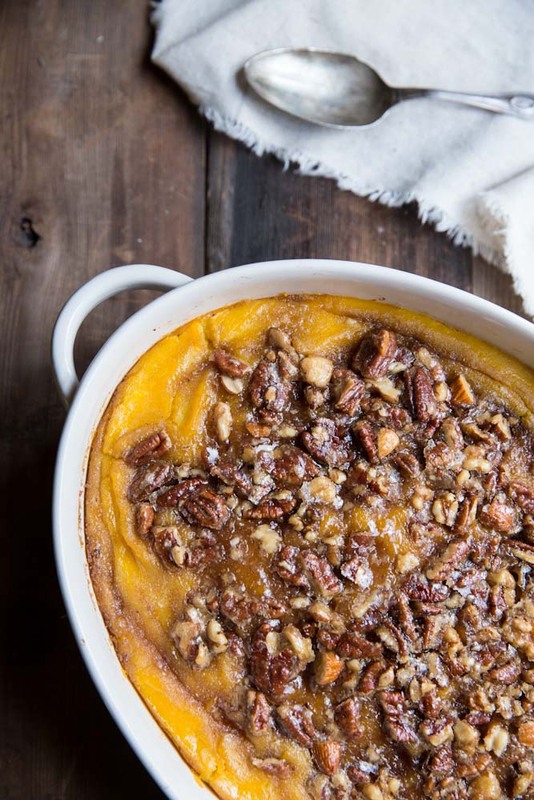 A more modern take on the Sweet Potato Casserole this time with Acorn Squash and a Maple Nut Praline. Preheat oven to 400 degrees F. Slice squash in half lengthwise and remove seeds and stringy insides. Place squash cut side facing up on a rimmed baking sheet. Inside each squash half, place 1/2 tablespoon of butter and 1 tablespoon of maple syrup. Sprinkle all of the squash with sea salt (about 1/2 teaspoon total). Roast for 40 minutes or until tender. Let cool, then spoon out the squash (including the butter and maple syrup) into a bowl. Place squash in blender with orange juice and zest, eggs, 2 tablespoons melted butter, baking powder, and 2 tablespoons of maple syrup. Then stir in 1 teaspoon vanilla, and the other half teaspoon of salt. 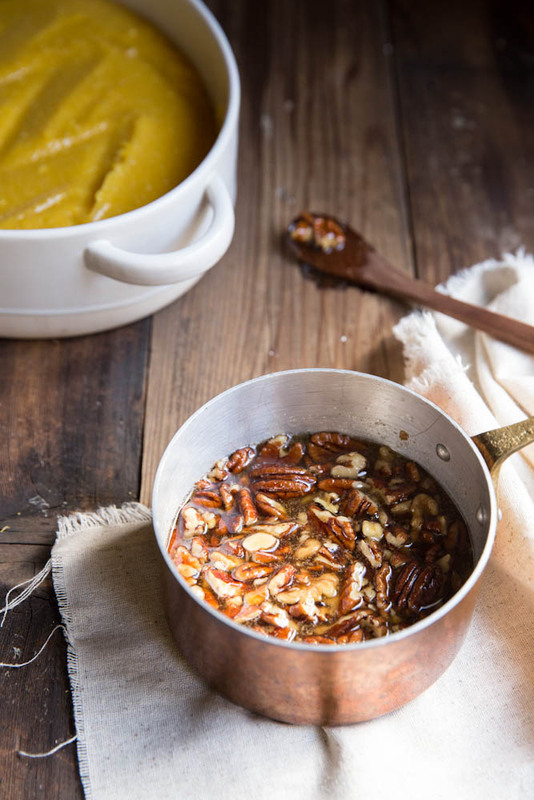 In a large saucepan over medium heat, combine pecans, brown sugar, the remaining 2 tablespoons of maple syrup, 1/8 teaspoon salt, the remaining butter (3 tablespoons) and 1 teaspoon vanilla and bring to a boil. Cook for 2 minutes more, then pour over squash mixture. Bake until bubbly, about 45 minutes. This was fabulous! Love that you went non-traditional with the acorn squash. Thanks friend! I was just so glad that everyone liked it! And your rolls…. amazing! What beautiful sides Becky! 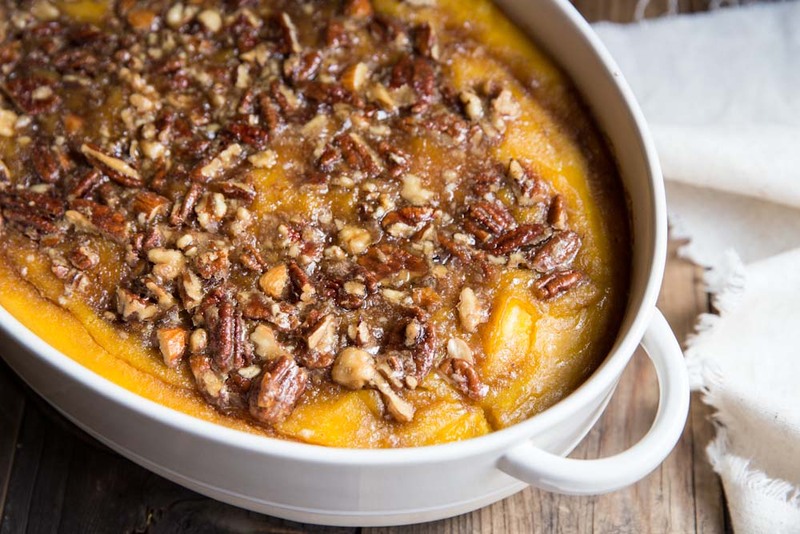 I am not a big fan of traditional sweet potato casserole, I think I would LOVE this! I’m excited to see the acorn squash in this one… I’ve not used it much other than roasting, and this is the type of casserole I love. The Praline looks so good I think I might be able to eat it all by itself. Hope you had a lovely Thanksgiving Becky! DELISH!!! Huge hit at Thanksgiving used spaghetti squash and winter squash, YUMMY!!!!! Great to hear Jolene!! Happy Holidays to you!